Earth formed about 4.55 billion years ago, but humans—the genus and species Homo sapiens— evolved only about 200,000 years ago. Indeed, nearly all of Earth's past climate occurred before there were people around to witness it. Only during the past millennium have people been chronicling important climatic events, and only in the past century have they kept accurate and consistent weather records. This chapter discusses some of what is known about past climate. Much of this knowledge is the result of the inventive use of the available evidence. Meteorology is the study of Earth's atmosphere with the goal of predicting the weather. Since the late 1800s, meteorologists have been measuring weather characteristics such as temperature, precipitation, and wind speed and direction from land--based stations and, more recently, from weather balloons. In 1960, meteorologists began to use satellites to gather weather data. Because satellites see a large and clear picture from high above Earth's surface, they are extremely important for chronicling global climate change. Satellites have gathered decades' worth of information on pollution, fires, ocean temperature, ocean current patterns, ice boundar--ies, volcanic ash clouds, and many other climate-related features. For example, images gathered each year for two decades detail the loss of ice cover during Arctic summers over that time period. Paleoclimatologists (paleoclimatology is the study of past climate) have developed many innovative techniques for getting information about the history of Earth's climate. These scientists use biological or physical clues, known as climate proxies, to unravel past climate patterns over the entire planet or over specific regions. These clues are found in ice cores, tree rings, and sediments, for example, and can be used to reconstruct past climate with surprising depth and accuracy. Some climate proxies, for example, preserve evidence of past temperatures. Using these proxies, paleoclimatologists have reconstructed Earth's climate history in differing amounts of detail that reach back millions of years. Unique tools are used for different time scales. Ice cores yield climate data that cover hundreds of thousands of years. 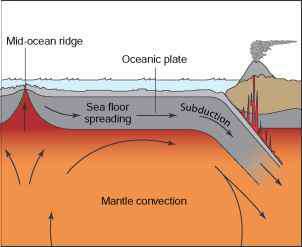 Sediments in the ocean floors go back millions of years. Sedimentary rocks from the surface of the earth are rocks that are made of sediments or that precipitate from water. These rocks can give general information about climate that goes back billions of years. Although tree ring cores taken from living trees are only useful for as many years as the tree has lived, logs that are preserved by becoming petrified in rock or sediments yield information about time periods that are much further back. The most powerful window into past climate is the ice contained in glaciers and ice caps. To collect an ice core, scientists drill a hollow pipe into an ice sheet or glacier. The cores taken from the Greenland and Antarctic ice caps supply data that span long periods of time: Two Greenland cores go back 100,000 years, while one Antarctic core goes back 420,000 years, through four glacial cycles. The European Project for Ice Coring in Antarctica (EPICA), about two miles (3,190 m) long, has cut through eight glacial cycles covering 740,000 years and is still being drilled. Mountain ice cores are thinner and have much shorter records, but they can be collected from regions scattered around the Earth. Polar ice caps may contain as many as 100,000 layers of ice. Each layer yields age and weather data from the time when it was deposited. High up in an ice core, close to the surface, each layer represents one year: The age of the sample can be determined simply by counting backwards from the top of the core. Deeper in the core, where the layers have been compacted by overlying ice, only multiple year blocks can be distinguished. To determine the age of a deeper layer, events with known ages that have left evidence of their occurrence in the layer can be identified. Useful recent events are nuclear bomb tests that have left deposits of radioactive isotopes in the ice. Volcanic ash is valuable for ice of any age because the ash can be correlated to specific eruptions far back in time. Age can also be determined by the chemistry of marine sediments. Gases and particles trapped in snowfall can be analyzed by examining ice layers. These substances represent atmospheric conditions at the time the snow fell. Scientists can analyze CO2 in the gases to determine the concentration of that greenhouse gas at the time and to ascertain its source, whether from volcanic eruptions or burning fossil fuels, for example. The presence of Beryllium-10 in the ice core is evidence of the strength of solar radiation. Ash indicates a volcanic eruption, dust an expansion of deserts, and pollen the types of plants that were on the planet at the time. The amount of pollen found in the ice layer may be an indicator of the amount of precipitation that fell. Paleoclimatologists can discern air temperature at the time the snow fell by measuring the ratios of different isotopes of oxygen and hydrogen. These isotope ratios also reveal global sea level. By using isotopes and many other chemical and physical indicators trapped in the ice, scientists can reconstruct atmospheric temperature, ocean volume, precipitation, the composition of the lower atmosphere, volcanic eruptions, solar variability, the productivity of plankton at the sea surface, the extent of deserts, and the presence of forest fires. Most importantly for paleoclimatologists, they can construct a record of climate change through the period of time represented by the core. Sediments collect in layers on seafloors and lake bottoms. Like ice, sediments can be drilled as cores with the oldest layer located at the bottom. Sediments can be found dating back millions of years. They ific Uses sium: potassium-39, potassium-40, or potassium-41. An atom is the smallest unit of a chemical element (a substance that cannot be chemically reduced to simpler substances) having the properties of that element. At an atom's center is its nucleus, which contains protons that have small, positive electrical charges and neutrons that have no charge. An atom's atomic weight is the sum of its protons and neutrons. A particular element, for example, potassium, will always have the same number of protons in its nucleus, but it may have a different number of neutrons. Potassium always has 19 protons but it can have 20, 21, or 22 neutrons. Therefore, the atomic weight of a potassium nucleus can be 39, 40, or 41, which creates the different isotopes of potas can be composed of sand, rock fragments, clay, dust, ash, preserved vegetation, animal fossils, and pollen. Perhaps the most useful sediments are the remains of plankton that once floated at the ocean surface before dying and sinking to the bottom. These tiny shells harbor many kinds of information on the conditions of the atmosphere and surrounding seawater. One type of plankton—small, coiled foraminifera (forams)—are extremely sensitive to ocean temperature, and therefore each of the species in this group is present only within a specific, narrow temperature range. The presence of a particular species in a core yields the sea surface temperature (SST) at the time the organisms lived. One species of foram, Neogloboquadrina pachyderma, changes its coiling direction from left a light water molecule. For that reason, the 18O/16O of the raindrop is higher than that of the remaining vapor. Hydrogen isotopes work the same way, with lighter 1H (one proton) more likely to be in water vapor and heavier 2H, (one proton and one neutron) more likely to be in liquid water. Air cools as it rises or moves toward the poles and releases some of its moisture. Because 18O is more likely to condense into a raindrop, the first precipitation to fall has a relatively high 18O/16O ratio. With time, the 18O is depleted from the air so the 18O/16O ratio of the raindrops decreases. Because air moves toward the poles from the equator, 18O/16O decreases with increasing latitude. As a result of these processes, higher 18O/16O indicates warmer air temperatures; lower 18O/16O indicates cooler temperatures. Therefore, 18O/16O is a proxy for temperature. 1H/2H can also be used to reconstruct the temperature at the time of precipitation. These isotopes can be used as a proxy for temperature in ice cores and marine sediments. As temperature increases and ice sheets melt, fresh water enriched in light oxygen returns to the sea. Low 18O/16O ratios indicate less ice cover and, therefore, higher temperatures. 18O/16O is also a proxy for local rainfall: Because the 18O precipitates first, low 18O/16O means that a large amount of rain has already fallen. to right when the surface water temperature warms above 46°F (8°C). With temperature information from all around the seafloor, scientists can reconstruct the patterns of ocean currents during any time period from the past 150 million years or more. The isotope ratios of marine fossils also contain useful information. 18O/16O in shells, teeth, bone, and other hard tissues yield the temperature at the time the organism lived. The shells of some forams contain an average of 2% more 18O during a glacial period than a warm period. 18O/16O can also be used to calculate the amount of the Earth that was covered by ice. Because heavy water is more likely to precipitate near the equator, snow that falls in the high latitudes is light. During an ice age, this light snow is trapped in ice sheets, and therefore seawater is enriched in 18O. The 18O/16O value of seawater is therefore directly related to the amount of 16O-enriched ice that covers the Earth. Oxygen isotopes also give information on sea level: A rise or fall in 18O/16O of just 0.01% indicates a 33 foot (10 m) change in sea level. Sedimentary rock does not give as detailed a picture of past climate as ice cores and marine or lake sediments. Sedimentary rocks' value is that they are widespread and are available from much further back in Earth history, even going back hundreds of millions of years. Sedimentary rocks contain the only remaining paleoclimate information for much of Earth history. Many sedimentary rocks can only be deposited in a restricted range of climates. Modern coral reefs, for example, only grow in the tropics; therefore, fossil reefs indicate that the region was tropical at the time the coral reef grew. Rock that was formed from glacial deposits indicates a cold climate, while coal was formed in a warm and wet environment. Limestone forms in warm shallow seas. The ratio of 18O/16O in sedimentary rocks indicates how much rain was falling when the rocks were deposited and where the moisture may have come from. Scientists can use these data to reconstruct atmospheric circulation patterns. Each year a tree grows a new layer of wood under the bark. This creates a tree ring, which varies in size depending on the temperature and precipitation conditions at the time of growth. Narrow rings are from cool, dry years and wider rings represent warm, wet years. Tree rings are useful only in locations where there is an annual seasonal cycle of temperature and precipitation, such as in the temperate zones. Trees do not live more than a few centuries, but evidence of past climate can be reconstructed from logs found in ice, permafrost, or glacial sediments. Tree ring data from petrified trees can yield information from much further back in time. The age of these trees can be determined using radiocarbon dating, which measures the abundance of carbon isotopes that undergo radioactive decay at a known rate. Scientists input the information gathered from modern measurements, paleoclimate data, and current ideas on how land, atmosphere, oceans, and ice interact into a supercomputer to construct climate models. A climate model can be created for a local area or for the entire Earth. Climate is very complex, and climate models are difficult to construct. Many aspects of climate are not well understood. Simple climate models look at a single atmospheric characteristic and its effect on a single condition, such as the effect of rising carbon dioxide levels on surface air temperatures. Simple models can be combined to generate more complex models. For example, the effect of rising temperature on separate layers of the atmosphere can be combined into a model of the changes in temperature and circulation expected for the entire atmosphere. The more factors that are put into the model, the more complex it is, and the less certainty scientists may have regarding the accuracy of the outcome. To check the validity of a new model, scientists try to replicate events that have already occurred. For example, they might construct a model to predict the effect of increased air temperature on sea surface temperature (SST) since 1980. They begin with air and ocean temperatures from 1980 and then input the increased air temperatures measured since that time. The scientists then run the model to see whether it correctly predicts current SST. If it does, the model can then be used to predict the future with some degree of confidence. Models are also continuously updated. The success of a model depends in part on the scientists' ability to account for the interactions of land, atmosphere, ocean, and living things. Yet, some factors are not well understood. Clouds, for example, have two competing effects on climate: They reflect sunlight back into space (as when a cloud passes overhead) and they trap heat (as on a cloudy night). If warmer temperatures increase cloud cover, the effects are unclear and so are not easy to model. Models must take into account feedback mechanisms, situations in which a small change in something in the system magnifies the original effect and therefore causes a much greater effect. Feedback mechanisms can go in either direction: With a positive feedback mechanism, one action leads to a set of events that increase that action. For example, as the Earth warms, water evaporates, which increases the amount of water vapor in the atmosphere. Because water vapor is a greenhouse gas, air temperature increases even more. The increase causes more water to evaporate and consequently causes air temperature to rise. With a negative feedback mechanism, one action leads to a set of events that weaken that action. For example, as the temperature warms, more water vapor in the atmosphere causes more clouds to form. Low clouds reflect a large percentage of incoming sunlight, which slows warming. This would be an example of negative feedback. Positive and negative feedback mechanisms show the complexity of the climate system. A partial list of feedback mechanisms that result from warmer temperatures is shown in the table on page 47.